Viewing 24 of 104 items. This roomy canvas bag is perfect to keep your little essentials handy. Bag has a zip closure and a finger loop. Size of bag is 7" H x 11" W x 3" D. Personalization style only as.. 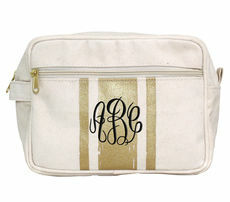 These cosmetic bags are perfect to keep your make-up handy. 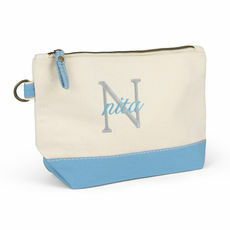 Cosmetic bag has a zip closure and a finger loop. Size of bag is 7" H x 11" W x 3" D. Embroidered in your choice of..
Personalized aromatherapy has discovered a new level in luxury. 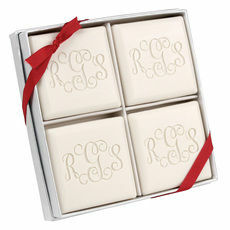 Custom etched 6.6 oz glass diffuser with your choice of initial or monogram. 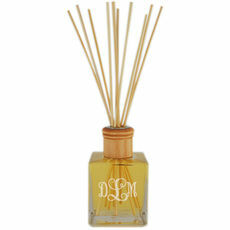 Size of diffuser is 2.5" x 2.5" x 4.25" H..
Is unscented what you are looking for? 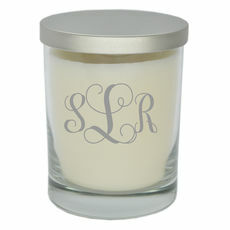 We invite you to enjoy our soy/palm blend, hand poured, New England made candles! 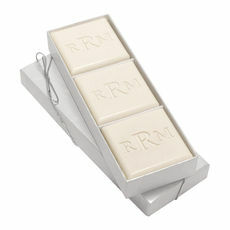 With an unbleached, all-cotton wick presented in a warm ivory color. Candle.. 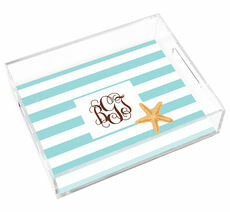 This personalized travel kit is the perfect small travel companion. Complete with a spacious lined interior, zip closure top and outside zip pocket. 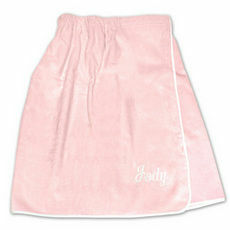 Size of bag is 6.5" H x 9.5" W x..
Wrap yourself in comfort and style with a cozy robe. 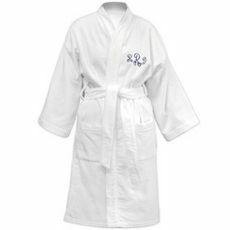 Our robes are hand crafted in the USA from 100% cotton terry velour trimmed in white piping. 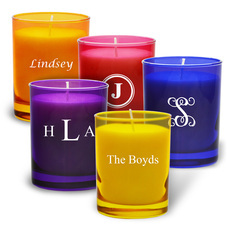 Your choice of size, embroidery style and embroidery..
Our hand poured, New England made candles are created with care and are a high-quality product. The candle is made from 100% natural and biodegradable soy wax (Non-GMO) and is phthalate free and dye..
Wrap yourself in comfort and style with our Spa Wrap in the color of your choice. 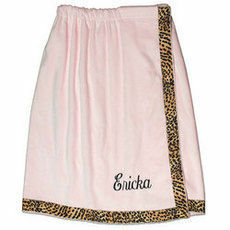 Our leopard trimmed wraps are hand crafted in the USA from 100% cotton terry velour, and feature an extra-long Velcro..
Wrap yourself in comfort and style with a bath shower wrap. Our wraps are hand crafted in the USA from 100% cotton terry velour, and feature an extra-long Velcro strip and soft-rolled elastic top..
Each of these New England made, hand poured unscented candles are 11 ounces of pure goodness. 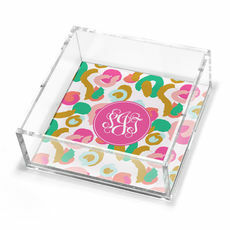 Candle is in a personalized etched glass container sized 3.5" in diameter x 3.5" high. Double.. This roomy canvas bag is perfect to keep your little essentials handy. Bag has a zip closure and a finger loop. 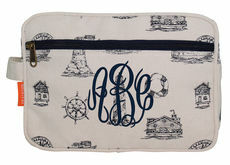 Size of bag is 7" H x 11" W x 3" D. Personalization style only as shown. Name will be.. These cosmetic bags are perfect to keep your make-up handy. 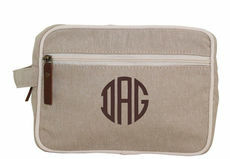 Cosmetic bag has a zip closure and a finger loop. 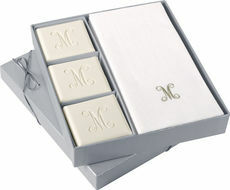 Size of bag is 7" H x 11" W x 3" D. Embroidered in your choice of personalization..
Set of luxurious DeVille Guest Towels with a linen-texture finish. 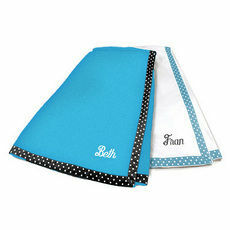 These are disposable excellent weight paper Guest Towels with a nice superior finish and are absorbent. Your personalization will be..